Using feed rate calculators does not really work for a hobby CNC like the X-Carve. The programs assume no flex in the machine. So we hobby folks need to do some experiments to find the best bit and parameters. I spend some time doing experiments to find the best bit and cutting parameters for a series of materials using the X-Carve. What spindle and motors and work area size are you using? 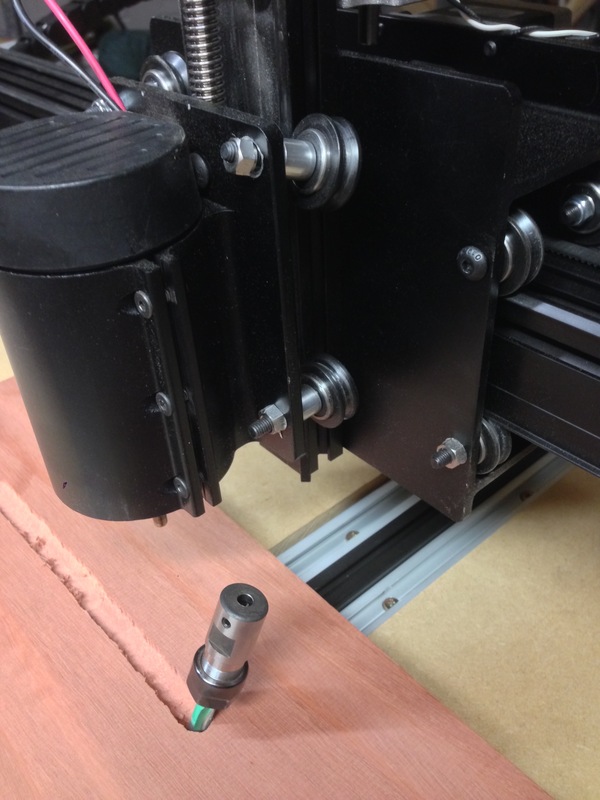 I use a Kress 1050 spindle, NEMA 23 steppers and the 50x50cm size X-Carve. I have tried using the spindle that was included with the X-Carve and it also worked fine for me on soft materials like MDF. I upgraded to Kress after some not so successful milling of aluminum. With the Kress that also was a breeze. Are you taking into account Spindle speed, tool diameter. Width of cut, direction of cut. Climb or conventional, tool deflection, tool material HSS or carbide, tool geometry ( end mill, ball end mill, chamfer, V-bit, dovetail, etc), tool stick out, surface feet per minute (SFM), chip load. spindle HP and more. If not then the numbers you have posted may work for you but not the next guy. You say feed rate calculators don't work. I have to disagree here. Using a good one like Gwizard where you can set it up for your machine and see the numbers for all the parameters I list above and chose from a large number of materials do work and work well. I did all experiments with fixed spindle speed and same tool diameter to reduce complexity. The bit I used are the Carbide set the Inventables sell. Re the Gwizard you might be right. I do not know it well. If it has a way to take into account that hobby machines flex - much more than e.g. tool deflection. The major thing that drives me nuts isn't the cutting process after it's started. My problems are the very first cut that the tool makes. Once the tool is cutting, it's generally only cutting around half the width of the tool. On the first cut however, the bit is cutting the full width of the tool - sometimes with catastrophic results. In the image below, I was attempting to cut some Jarrah (a beautiful Australian hardwood), using speeds, feeds and depth of cut I'd used several times already. This time however, because the bit began cutting in the centre of the job, it was having to cut full-width and full-depth which was beyond the capability of the V Wheels and the original 300W motor & spindle - there's nothing like breaking the collet off the motor to make you think "Perhaps an emergency stop button could be a nice addition..."
I'm sure there's several solutions to the problem (one of which involves me reading my VCarve help files), but I just wish I could get the code to begin slowly, then once it's made the first hole, ramp up the speeds & feeds appropriately. BTW - My DeWalt mount arrived the following day and I went out and bought the router and fitted it that night. Take a look at ramping toolpaths (in v-carve), that might get you what you want. Vcarve does allow "ramping" which defines how the bit will enter the material when cutting. Thanks for the quick response, I suspected as much. Reading the manual is not nearly as exciting and watching the collet snap off! @AllenMassey - Exciting is one word for it. If you look at the picture, you'll also see the V Wheels are damaged and the holes carrying the eccentric nuts are almost large enough to allow the nuts to pull-though the mounting. All completed in around 10 seconds. The noise was almost as impressive as my vocabulary immediately after the event. Not one of my better jobs. Wow. And I thought I made a mess when my bit cut a slot clean through the wasteboard. Bad things can happen quickly. I see an E-Stop in your future. @AllenMassey - They're the largest stock motors that come with the X-Carve (Nema 23 I think, without looking them up). All ended well. I'm making lots of sawdust and I've now finished the wooden clock that prompted me to go down this path in the first place. That is the really great thing about the X-carve. After building it and understanding how all the components work, it is easy to fix whatever damage we manage to inflict. That has to take the prize of the worst machine crash picture ever. It also reinforces the fact that this is just a low cost DC motor with a collet adapter on a small shaft. Glad you were able to get your machine up and running again quickly.